If you want to understand what drives customer satisfaction for your business and how to align your business to improve customer loyalty, we offer a range of services to support you in developing your customer satisfaction feedback. Creating an effective process to measure customer satisfaction, capture customer feedback and delve into the drivers of customer loyalty is important for your business. 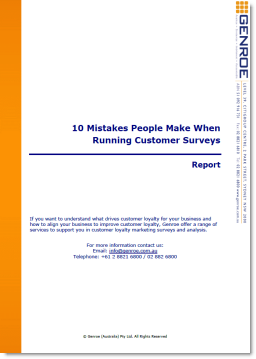 Customer surveys are just the start of the process. We also link the impact of customer satisfaction changes with improvements in business value to support business cases. Whether you want to perform an internal customer survey or an external customer survey there are many ways to tap into the voice of the customers. Genroe helps you to really listen to what your customers are telling you through a range of techniques: face to face and telephone interviews, email and web questionnaires.